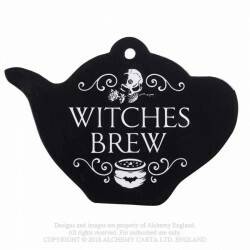 A fun and functional teapot shaped coaster baring the 'Witches Brew' design. A darkly beautiful addition to any kitchen. 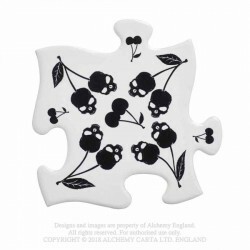 This piece can be used as a coaster for mugs, pans, teapots and more! 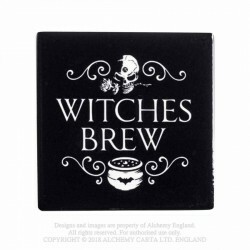 What a wonderful gift it would make for any Witch that enjoys her brew! A uniquely designed spoon rest for those that are looking for darkly distinctive home wares. 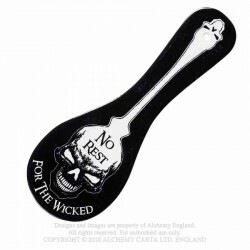 This piece will look stunning by your hob as a fully functional spoon rest or hung on the wall as a darkly fun addition to your kitchen! 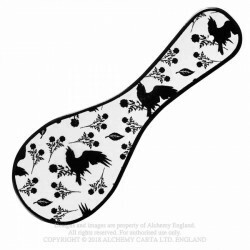 A beautiful spoon rest decorated in the elegant Alchemy raven and rose design. This spoon rest will be a beautiful addition to your kitchen either by the hob or hanging on the wall. 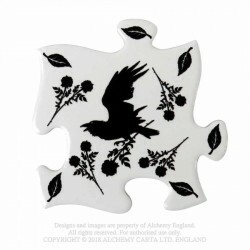 This darkly elegant design is also presented on a matching trivet/ chopping board and jigsaw coaster/ trivet set. 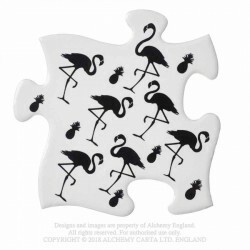 This unique 4 piece black flamingo and pineapple design jigsaw coaster set, can be used as individual coasters or joined together to used as a heatproof trivet. Its quirky design will look fabulous in any room of your home and will certainly get your guests minds working when figuring out how its put together! Black cherries or black skulls? You decide! 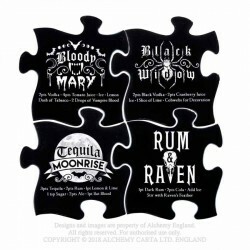 This uniquely designed 4 piece coaster set can be used as individual drinks coasters or joined together as a heatproof surface for a larger items, such as hot pans or dishes. 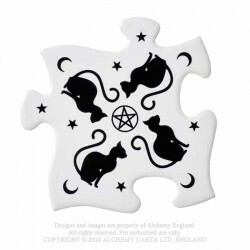 This jigsaw set would make a fabulously unique gift for a friend or look stunning in your own home! Are you feeling a little absent minded? 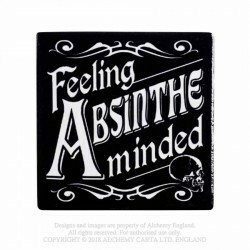 Perhaps its the Absinthe! 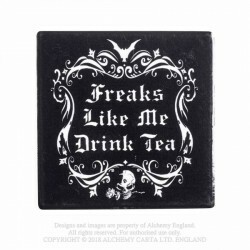 This 'Absinthe Minded' coaster is one of the 10 new unique Alchemy designed coasters why not collect them all!